The body of the Russian pilot killed after his warplane was downed by Turkish forces on the Syrian border has been flown to Ankara, to be met by Russian diplomats. Lt. Col. Oleg Peshkov’s coffin was flown to Ankara from southern Turkey. It is not yet clear when the body will be repatriated to Russia. Turkish forces shot down the Russian military jet saying it had violated Turkey’s airspace, which Russia denies. Russia announced economic sanctions against Turkey. Rebels from Syria’s ethnic Turkmen community opened fire on Lt. Col. Oleg Peshkov and his co-pilot as they tried to parachute into government-held territory on November 24. The rebels said the Russian pilot had died by the time he reached the ground. On November 29, Lt. Col. Oleg Peshkov’s body was received by Turkish authorities at Hatay airport on the Syrian border. 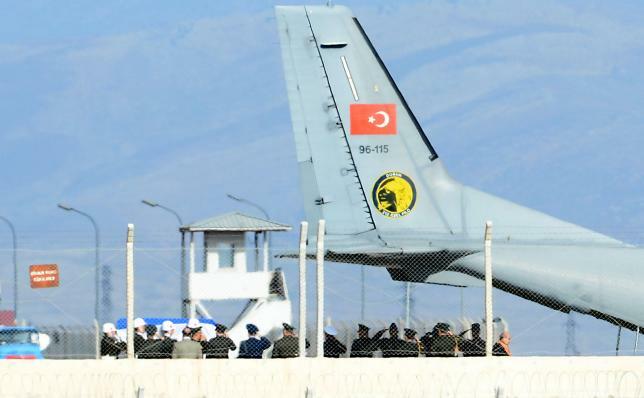 A Turkish honor guard carried the coffin on to an air force plane for the flight to Ankara. Turkish PM Ahmet Davutoglu added that the pilot’s body had been treated in accordance with Orthodox Christian tradition. Russian news agencies said the body was accompanied from Hatay to Ankara by the Russian military attaché, and would be met by Ambassador Andrei Karlov in the Turkish capital. The other pilot in the plane, Capt. Konstantin Murakhtin, survived and was rescued from rebel-held territory in Syria in a special forces operation. Capt. Konstantin Murakhtin said he wanted to go back to duty and stay in Syria, saying “someone has to pay” for his colleague’s death.